A guest post from loyal reader and technical Montana native Mrs.5000. I happened to be finishing up a visit to the C.M. Russell Museum (cowboy art!) 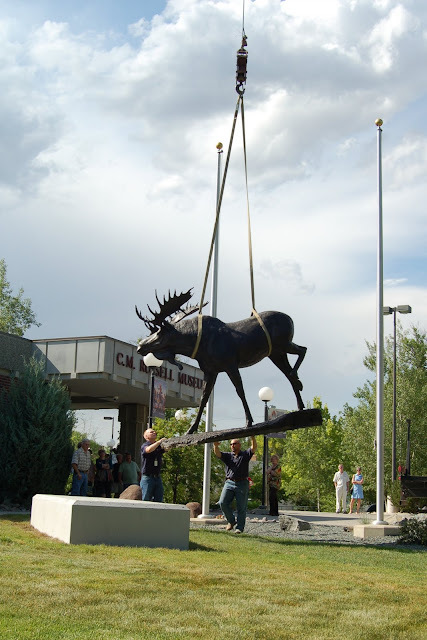 in Great Falls, Montana, just as a crane arrived to transfer a moose sculpture onto its pedestal on the new sculpture garden. It's not every day one gets to see that kind of operation, so I settled under a shade tree to watch events unfold. 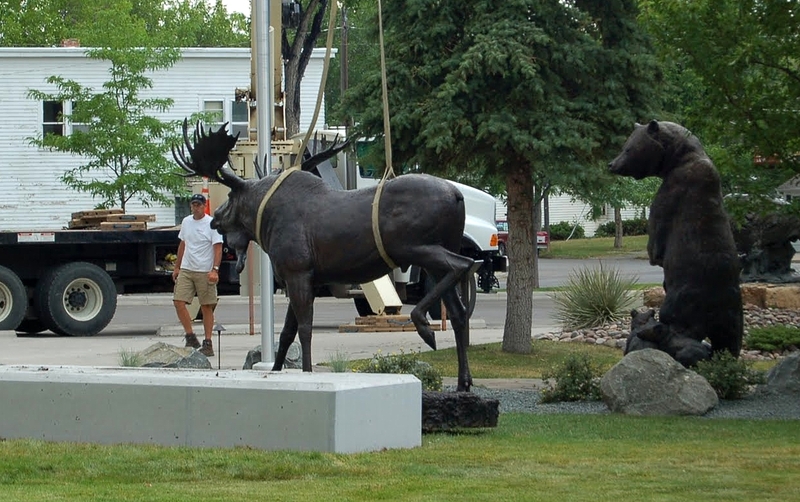 The crane operator clearly knew what he was doing--he did a quick mooseless test run (threading two flagpoles between sculpture and pedestal) and harnessed up the moose. Even a bronze moose, if life sized and realistically portrayed, exudes an air of patience when quietly hoisted into the air. The glitch came as he was lowered onto his pedestal. The anchor bolts at the base of the sculpture did not quite align with the epoxy-filled holes on the concrete base. Several tries were made, but the moose refused to settle into place. Apparently at least one of the bolts was not perpendicular to the base, and this had thrown off the template. The solution was pretty obvious--one or more of the holes would have to be enlarged--but the rapidly setting epoxy and a lack of tools on hand made this an unwelcome complication. I haven't mentioned that this was Friday evening, the public dedication of the sculpture garden was set for 10:00 the next morning, and stormclouds were gathering for what would prove to be an ungodly deluge. Sometimes it's nice just to to be a bystander on vacation, and know that matters are in someone else's hands. Five years ago: Michael5000 pulls the plug on public radio (he's never gone back). I know that museum as that is where I went to high school and where my family still lives!!! I didn't know Mrs 5000 was a Montana native. From Great Falls? We should see if we have any common friends!!! Guess this is evidence that meece should not fly. moose? whatever . . .
so what happened? the suspense! did the moose make it in time for the public dedication? @Gretchin: HOW IT ALL TURNED OUT! Of course! You're dying to find out! But I had to get on a plane at 6:30 the next morning! And I haven't found anything online about how things went...museum websites and local newspapers are all into announcing upcoming events, they're not always so good at covering them. Perhaps I should inquire? I promise to inquire. 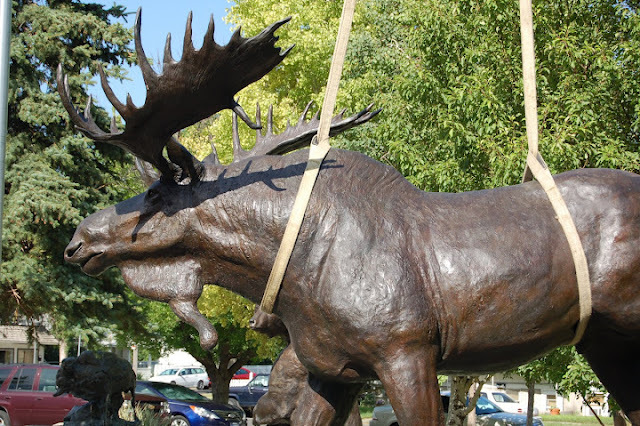 The moose is in place but not without some good old American ingenuity; First he had to be lifted off and away while our staff re-drilled the holes and then re-welded two anchors after which Mr. Moose fit perfectly and permanently in his new home. All was in good order for the opening ceremony and the attendance was great on a lovely, Montana, morning where if I recall correctly, cookies and apple juice were served and the whirring noise we all heard was Charlie spinning in his grave at the thought of a party with no 'hooch'. As your traveling Portland-based fact-checker, I'm gonna check on that moose next week. My brother is a native of Great Falls. Mom, Dad and bro moved to Portland when he was a precocious eight-day old. Cool story. Mrs 5000 was wise to sit and watch.